After your tooth’s root canal treatment has been completed, your dentist may recommend the placement of a dental crown. 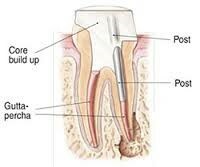 A post and core is indicated when a large part (or all) of a tooth’s original crown structure has been lost. The crown structure can be damaged either due to the progression of dental decays or because of a tooth trauma.